Not only is wound coding and documentation a constant source of confusion, but it also attracts intense scrutiny from auditors, with severe financial penalties for mistakes. And it’s only gotten more challenging with the increased specificity required in ICD-10. Eliminate the confusion and your risk for ADRs and denials with the ICD-10-CM Wound Coding & OASIS Field Guide, 2019. 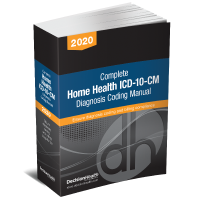 The ICD-10-CM Wound Coding & OASIS Field Guide, 2019, is your on-the-go reference to choose the right ICD-10 code and complete the OASIS for the most common home health wounds. It is conveniently separated into chapters devoted to each type of wound commonly seen in home health, including pressure, arterial, stasis and diabetic ulcers, and surgical, trauma and complicated wounds. Each chapter contains official coding and OASIS wound guidance, as well as specific strategies and real-life wound photographs to help guide you towards accurate code selection and OASIS answers. You won’t find a more detailed, real-life instruction wound book than this on the market! New: Updated with FY2019 code changes and latest CMS OASIS-D guidance updates so that you have the most recent information to code accurately. New: Get the latest on how to code and complete the OASIS for surgical wounds, and pressure and stasis ulcers covered with skin vs. muscle grafts. Vital ICD-10 coding principles, official OASIS guidance, expert tips, helpful scenarios and important tools organized by type of wound, allowing you to quickly find the answers you need. Real-life color photographs of each type of wound to help guide assessment and coding. A chapter devoted to wound documentation discusses what Medicare requires to justify home health reimbursement for wound care, and what you need to do to ensure that your coding and OASIS answers are fully supported. Inaccurate wound coding will leave your agency open to auditor scrutiny, resulting in ADRs and denials. Don’t take that risk. 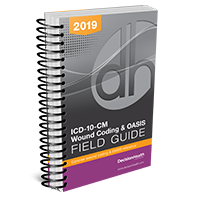 Order your ICD-10-CM Wound Coding & OASIS Field Guide, 2019 today.